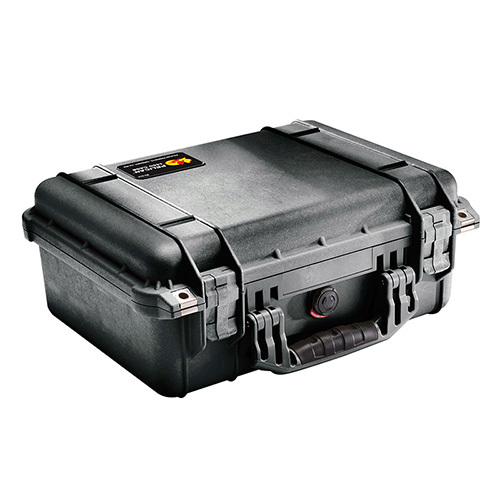 Buy Pelican 1450 Protector Medium Case Polypropylene Black 16 x 13 in. Pelican 1450 Protector Medium Case Polypropylene Black 16 x 13 in. x 6.875 in. (Exterior) in. Pelicans Protector series Medium Case has a comfortable rubber overmolded handle easy open double throw latches open cell core with solid wall design and automatic pressure equalization valve. With its nitrile Oring seal it is watertight crushproof and dustproof. This case also features stainless steel hardware and padlock protectors with pluckable foam in the 1.75 lid. Interior dimensions are 14.66" L x 10.24" W x 6.12" H and it weighs 6.39 lbs."